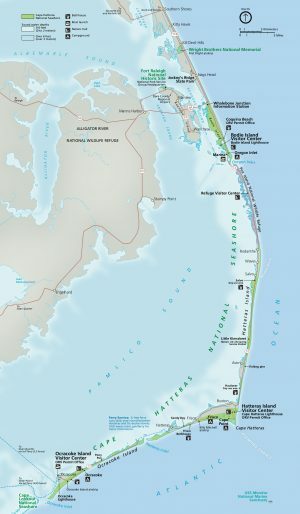 Off the coast of North Carolina, there’s a thin stretch of islands called the Outer Banks. It spans 200 miles. And there’s one part of the Outer Banks that used to be especially treacherous for ships. 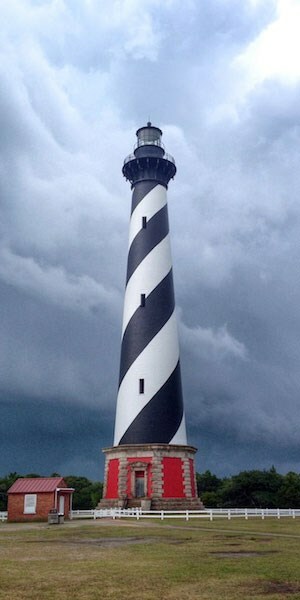 With so many sailors dying, Congress authorized the construction of a giant lighthouse in the late 1700s. It went up in a small town called Buxton, North Carolina near Cape Hatteras. Since then, generations of people in Buxton have helped staff and maintain the lighthouse. It’s become an important symbol of the community. Businesses are named after it, like the Lighthouse View Motel and Lighthouse Sports Bar and Grill; churches, too, like The Lighthouse Christian Assembly. It is a source of pride, and a vital part of the local culture and economy. But back in the 1970s, it looked like Buxton might lose their beloved lighthouse. The sea was getting closer and threatening to swallow it up. And people were torn over what to do about it — they could move the lighthouse, or leave it in place and try to defend it against the forces of nature. For the next 30 years, the people of Buxton fought an intense political battle over this decision. It’s the kind of battle we can expect to see a lot more of as sea levels rise and threaten coastal communities around the world. In the 1980s, Pilkey used to pack his students into buses and take them to Cape Hatteras. He’d explain that the waves were slowly eroding the shoreline. For decades, different government agencies had been fighting back against the sea. They’d tried barriers to slow the waves. They’d put down a wall of sandbags. 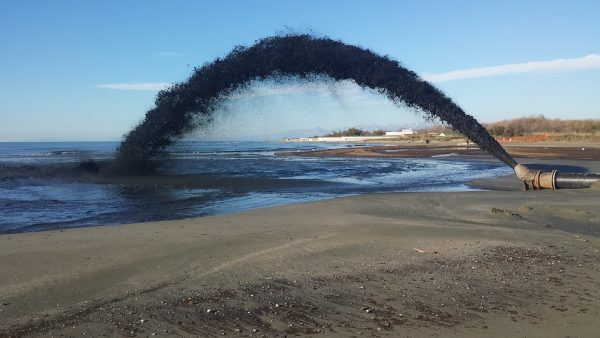 They’d even tried an approach called “beach nourishment,” which means pumping a ton of sand onto the shore. But nothing seemed to work. After decades of failed attempts to stop the erosion, the ocean was getting dangerously close to the lighthouse. And in 1974, Pilkey wrote an academic article about the problem, basically suggesting that every reasonable solution had been tried, and that it was time to give up. And then he started telling the people of Buxton to let their lighthouse go. This did not go over well with the locals. In 1981, a photographer and conservationist named Hugh Mortonstarted a group called “Save the Lighthouse.” School children across the state raised money in support. The group recruited prominent North Carolinians, like university presidents, business leaders, and politicians. Some locals like Danny Couch, who became a representative for Save the Lighthouse, advocated for the idea of building a solid concrete wall around the lighthouse. But Pilkey had maps and diagrams showing how sea walls are actually counter-productive and often lead to accelerated erosion. Then one day Pilkey met an engineer named Dave Fischetti, who suggested a novel compromise: instead of building a sea wall or letting the lighthouse fall into the ocean, why not move it? Even though the lighthouse was 200 feet tall and weighed 4,800 tons — engineers had moved bigger structures. And this presented an opportunity, to test something that planners call “managed retreat.” The idea is that, as sea levels rise, we won’t be able to to defend every coast with a giant wall. Instead we’re going to have to make plans to abandon certain areas and make choices about what to move out of the way. Pilkey thought that if Buxton could be convinced to move this big lighthouse, it might show that managed retreat is feasible. So now there were two different groups, and both wanted to defend the lighthouse, but in different ways. Ultimately, it would be up to Congress and the National Park Service (because the lighthouse sat on federal land), so each group was trying to convince the government of their plan’s superiority. People like Danny Couch of “Save the Lighthouse” were sure they would prevail. They were skeptical of outsiders telling them what to do. Some were concerned that the structure might break in transit. Others were worried about compromising its historic value. And, of course, there were local seaside businesses, with views of the lighthouse, that would be directly impacted by a lighthouse move. Throughout the 1980s and 90s, there were lots of scientific committees, commissions, studies, and reports centered on the lighthouse. They all concluded that moving the lighthouse was the best idea, but that didn’t do much to convince many locals. Bruce and Cheryl Roberts were an exception. Then, in 1996, two major hurricanes hit North Carolina: Hurricane Bertha and Hurricane Fran. Severe weather like this was becoming more frequent and more intense, creating a new sense of urgency. So in 1997, Congress started planning a potential move. A U.S. Senator from North Carolina and a state senator from the region organized a debate in April of 1998. It was attended by close to 800 people and about a dozen news crews. The crowd was quite clearly against moving the lighthouse. But a few days later, Cheryl and Bruce got a call from state senator Marc Basnight. He had previously supported the moving strategy but was having second thoughts after attending the meeting. So Cheryl spent over an hour on the phone and explained to him about the foundation, eventually winning him over to her side. He, in turn, urged Congress to act fast, and a few months later, they funded the move. In a last-ditch effort, the local county sued but lost. It was a stinging reminder that even though it may have felt like Buxton’s lighthouse, it wasn’t. It belonged to the federal government. The DKQ moves to the new site on 2/25/99. On 3/18/99 preparations are made to add more steel mat and more shoring towers. On 5/04/99 looking down from the top of the lighthouse. On 5/06/99 the last of the steel mat is down. 3/29/99 Removal of the foundation continues. As the lighthouse inched to its new home, it was again set to stand 1,600 feet from shore — the same distance that it was in 1870, before the sea washed the beach away. By 2100, at least 500 US communities will be at risk from sea level rise, including major cities like Miami and New Orleans, according to the Union of Concerned Scientists. And then there’s the millions of people in other parts of the world that will be affected too. 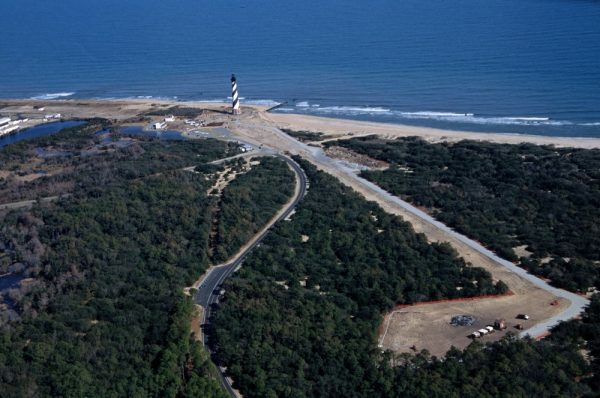 And even after all of this, the Cape Hatteras lighthouse will probably have to move again. It might last 100 years at its current location. But some scientists say it could be even less than that. Pilkey, Orrin H. “Let the Lighthouse Fall In” High School Journal, pp 1-10, Oct 1974. Carr, Dawson. Cape Hatteras Lighthouse Sentinel of the Shoals. 2 edition, Univ of North Carolina Pr, 2000. Jay Jennings. The Cape Light: Away from the Edge. WRAL-TV, 4 Sept 1999. 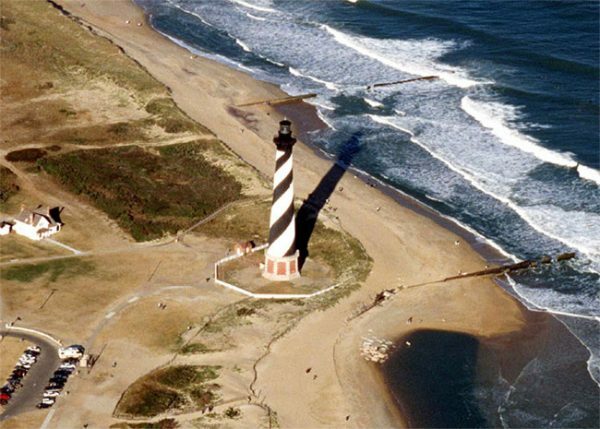 “Saving Cape Hatteras Lighthouse from the Sea: Options and Policy Implications” NAP.edu. www.nap.edu, . Today’s episode was produced by Gordon Katic and Sam Fenn, and edited by 99% Invisible’s Delaney Hall. Also from 99% Invisible’s staff: mix and technical production from Sharif Yousef, music by Sean Real, and the text from this post is from their digital director Kurt Kohlstedt. The rest of the staff includes Katie Mingle, Avery Trufleman, Emmiett Fitzgerald, Taryn Mazza, and Roman Mars. From Cited, Josh GD, Alexander B. Kim, and John Woodside assisted in the production. Cited is a podcast and radio show funded by the Social Sciences and Humanities Research Council and produced out of the world class Michael Smith Laboratories at the University of British Columbia in Vancouver. Follow us on iTunes, Twitter, Facebook, and email feedback to cited.podcast@ubc.ca.